The GCL South teams all play conference games this weekend, and the ECC, GMC and CHL all feature critical league contests. 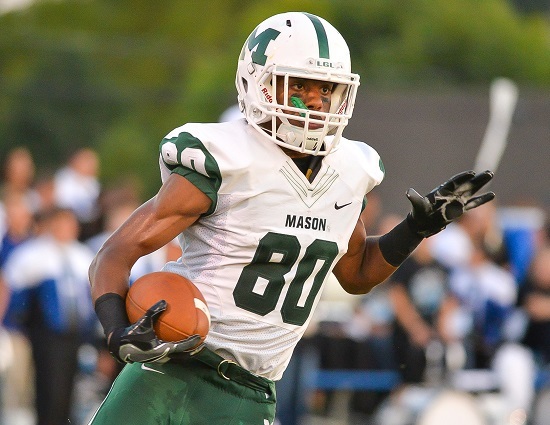 Mason is the next team to take a shot at Colerain’s conference winning streak that is approaching a decade long, but the Comets would have to pull that off on the road. Mason (4-1) at Colerain (5-0), 7 p.m. – Mason has consistently been an above-.500 team but, but like every other GMC team has not been able to take down Colerain. The Comets’ only loss was to Moeller by three points. Matt Sora has been Mason’s top offensive weapon, with 585 rushing yards – third-best in the conference – and six touchdowns. The Cardinals won their first three games by three, six and six points before pounding Princeton and Sycamore in their first two GMC contests. Monalo Caldwell leads Colerain in rushing with 335 yards and five TDs, and after averaging just 3.4 yards per carry his first four games, he ran for 95 yards on just nine touches last week. After giving up 28 points in their season opener, the Cardinals have given up just 28 more since and lead the conference with 11.2 points allowed per game. Moeller (3-2) at La Salle (3-2), 7 p.m. – Moeller plays all three of its GCL games in consecutive weeks, starting with a 21-14 loss to St. Xavier last week. R.J. Khayo leads the Crusaders in catches (19), yards (311) and receiving touchdowns (3), and Colin Thurman has been a workhorse out of the backfield with 87 carries for 401 yards and three TDs. Christian Turner has been La Salle’s top receiver, with 22 catches for 308 yards and three scores. Jerell White has 61 rushes for 317 yards and five touchdowns. La Salle has won this regular season matchup in back-to-back years, including a 13-7 overtime victory last year. St. Xavier (3-2) at Elder (4-1), 7 p.m. – After losing its first two games, St. Xavier has reeled off three straight wins, including one last week in its GCL opener, 21-14 over Moeller. The Bombers are averaging just 229.6 yards of offense per game, and just 61.4 on the ground. Sean Clifford has the better QB numbers for St. Xavier, going 37-for-61 for 467 yards and two TDs. Cameron Specht has 23 catches for 303 yards. Elder’s Danny Nieman is 88 of 133 – a 66.2 percent completion rate – for 991 yards. Three Panthers receivers have at least 20 catches and 200 yards. Jack Mazza has gained 365 yards on the ground and scored five TDs on 92 carries. The last two regular season meetings between these teams have both gone to overtime, with Elder winning last year and St. Xavier picking up the victory in 2014. Kings (4-1) at Turpin (5-0), 7 p.m. – Kings, Turpin and Loveland are the three 2-0 ECC teams, and this game could determine the conference champion. The Knights have scored 89 points in their two league wins, and Tyler Knecht is second in the ECC in passing yards with 1,156. Sophomore Jake Stylski was limited to two carries last week after rushing for 231 yards in Week 4. Turpin is allowing just 8.2 points per game and 175.8 yards – including a league-best 74.2 on the ground. The Spartans run it two of out of three times, with Nathan Hooper piling up 445 ground yards and Will Hausfeld scoring six touchdowns. Speaking of red-zone targets, Jake Silverstein has caught nine passes for Turpin, and five have gone for TDs. Anderson (3-2) at Loveland (2-3), 7 p.m. – Anderson has lost two of its first games despite averaging an ECC-best 45.2 points. The Redskins rebounded from back-to-back losses by beating Withrow by 29 last week. Anderson QB Jay Volpenhein has thrown for 1,709 yards, more than 550 above any passer in the league. Not surprisingly, the Redskins boast three of the top four ECC receivers in terms of yardage (Jake Newton 451, Amadez Jones 384, Austin Watt 295). Loveland was 0-3 entering conference play but has beaten Withrow and Milford to open its ECC slate. By contrast, the Tigers are all about the running game, as they throw the ball just nine times per game. Zion Wynn leads three 250-plus yard rushers with 376 ground yards and four touchdowns. Mariemont (4-1) at Wyoming (5-0), 7 p.m. – These teams have played the same two CHL foes, and while both blew out Taylor, Mariemont lost to Indian Hill by four touchdowns while Wyoming took down the Braves in double overtime. This game should feature a significant amount of passing. Wally Renie has been one of the best young QBs in the area this season, going 53 of 85 for 899 yards and 14 touchdowns, and three Warriors have over 150 receiving yards. The Cowboys throw the ball throw the ball 48 percent of the time, with Andrew Marty going 73-for-126 for 1,175 yards and 12 TDs, and Jake Edmonds and Garyn Prater are second and third in CHL receiving yards with 385 and 368, respectively.